A news organization in Guatemala discovered a clandestine drug trafficking airstrip located in the vicinity of a military post and property owned by a transnational company, raising questions about ties between organized crime and elites in the area and the difficulty of preventing the illegal use of private property for criminal activities. 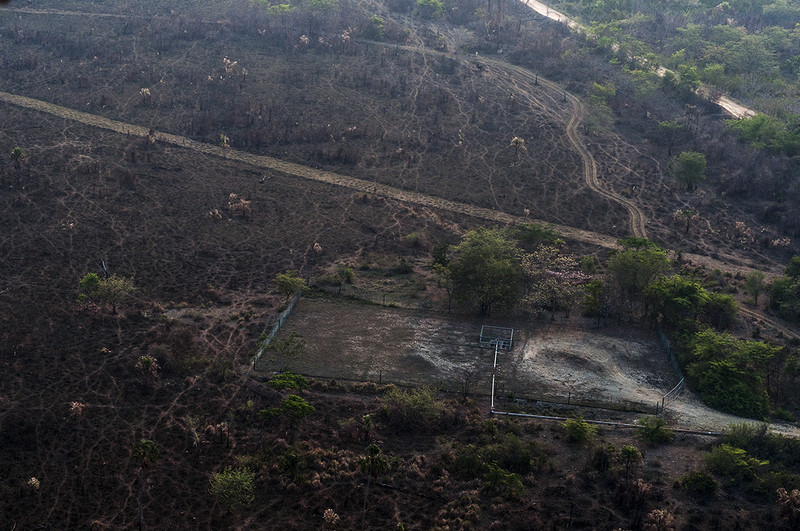 While conducting a flyover of Laguna del Tigre National Park, part of Guatemala’s Maya Biosphere Reserve in the northern province of Petén, Plaza Pública stumbled upon what appeared to be a one-kilometer clandestine airstrip hidden in plain sight. According to the news outlet, the track of land where the airstrip is located is notable for its proximity to property owned by a foreign company as well as a military outpost. It is a mere 25 meters from the regularly-patrolled Xan oil field, operated by the British-French oil and gas company Perenco, and about six kilometers from the military facility. After being shown pictures of the dirt runway, Aldo Chapas, the country’s chief anti-narcotics prosecutor, told Plaza Pública that it had telling signs of a clandestine airstrip. But he said an investigation would have to be launched to confirm the details and determine whether the runway was authorized. The news outlet later followed up with Guatemala’s Director General of Civil Aviation, who confirmed that the airstrip was not authorized. When Perenco was questioned about the suspected clandestine airstrip, Director of Corporate Affairs Antonio Minondo Ayau said that the company had no knowledge about the existence of the runway or about the identity of the individuals apparently trespassing on the company’s land. Similarly, Col. William García, the army press chief, said he was unaware of the runway, but noted that the military had knowledge of the existence of 65 other unauthorized airstrips in the national park, 23 of which have been destroyed by the government. According to Chapas, the proliferation of clandestine airstrips in the national park is a result of its proximity to Mexico, which makes the area an ideal drug transportation corridor for northern-bound planes from South America seeking to refuel. Petén has long been notorious as a hub of criminal activity in Guatemala under the control of criminal organizations like the Mendoza family and the Zetas. A good portion of the cocaine headed for the United States passes through this region, which has also seen the loss of some 40,000 hectares of forest in the last decade due to illegal logging and deforestation for the creation of airstrips. Part of the problem in Petén is that the interactions between communities and criminal groups in the area often blur the boundaries between what is lawful and illicit, with locals being paid by criminal groups to engage in environmental destruction and with many local elites, including Perenco, believed to coexist with or even tolerate the presence of criminal elements. Though no direct evidence of such complicity between local elites and organized crime in this particular case, the situation nevertheless speaks to the government’s lack of capacity in detecting, let alone preventing the illegal use of private property for criminal activities, particularly in remote areas, a problem also faced by other countries in the region. In Guatemala, this is demonstrated by the severe underfunding of CONAP, the agency tasked with looking into these matters in the country’s protected areas, as well as the army press chief’s admission that less than half of the known clandestine airstrips in the area have been demolished, with the rest presumably still operational. Even if all clandestine airstrips were successfully destroyed, however, drug flights would only be temporarily reduced, as drug trafficking and criminal activities are likely to persist in the area unless the broader problem of limited state presence is resolved.